As fall began to bleed into winter, everything seemed to go wrong for Oakland Mayor Libby Schaaf. The unions were already nipping at her heels with a campaign-style website portraying her leadership in dire tones. An August raid by ICE agents in West Oakland, is later found to have been aided by Oakland Police. Did the police chief know her department was coordinating in a deportation case? Did Schaaf know beforehand? Then in early December a barrage of bad news hits the mayor’s office within a 10-day period. First, 3,000 city workers, led by SEIU Local 1021, go on strike for seven day, in the meantime, slamming Schaaf at every opportunity. Uncertainty over the A’s staying in Oakland returns during the same week, and ends with the untimely death of Schaaf’s colleague across the bay, San Francisco Mayor Ed Lee. All the while, sprawling tent cities are visible all over the city. Progressives may not like Schaaf, but we start the last part of 2017 with another subject that angers lefties in the East Bay. ●Alameda County Supervisor Nate Miley uses the horrific shootings in Las Vegas as a pretext to support Urban Shield, the annual emergency disaster preparedness event in Pleasanton, that is highly unpopular to local progressives. first dispensary into operation next year. >>>>To the dismay of San Leandro’s city administration, its Board of Zoning and Adjustments rejects the city’s recommendation against a medical cannabis dispensary near the Davis Street Family Resource Center. The issue is not settled, though, but could be finalized by late January 2018. 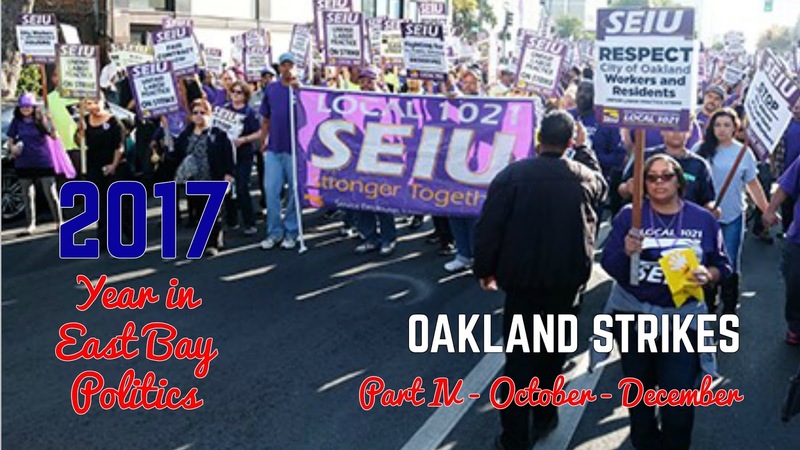 ●The seeds of a future strike in Oakland are sown when SEIU Local 1021 files a lawsuit against the City of Oakland alleging its use of temporary employees violates the City Charter. ●Oakland Police Chief Anne Kirkpatrick says she didn’t know beforehand that the Aug. 16 ICE raid in West Oakland would include a deportation. The comments come after a member of the Oakland Privacy Commission said the Kirkpatrick had been less than truthful about the controversial raid. ●As uncertainty over the A’s returns, the makings of an awful holiday season for Oakland Mayor Libby Schaaf becomes clear after 3,000 city workers declare a strike on Dec. 5 that lasts seven days. Workers head back to work, though, without a deal, as the city and union head to mediation. 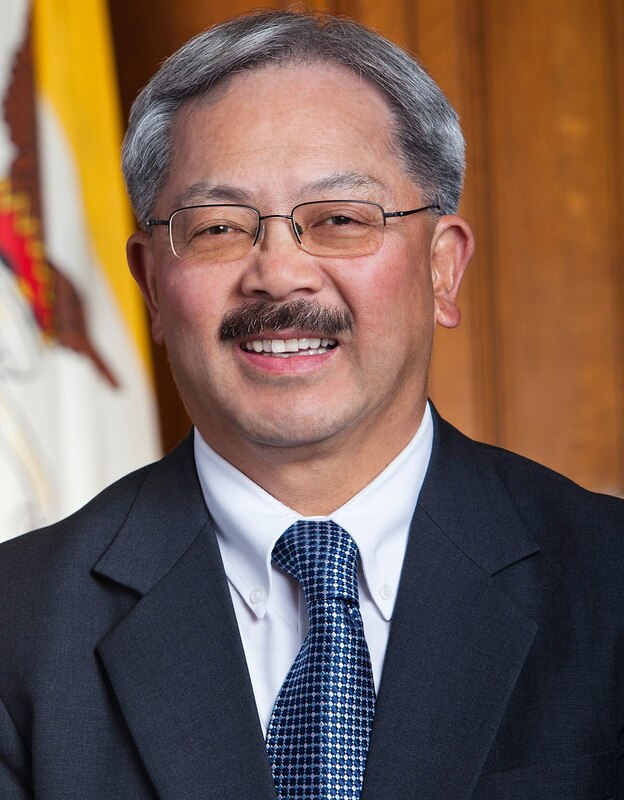 >>>>Although, not an East Bay story, the entire Bay Area is shocked by the sudden passing of San Francisco Mayor Ed Lee from a heart attack on Dec. 12. He was 65. ●Fremont starts and finishes the year on a wild note. Maybe the sudden expansion of its council to seven seats starting with next fall’s election is making Fremonters antsy? Mayor Lily Mei and Councilmember Vinnie Bacon get hit with fines for violating state campaign finance laws. ●With the onset of legal weed in California just days away, the Alameda County Supervisors give approval for its two medical cannabis dispensaries, both located in the unincorporated areas, to apply for temporary state licenses to sell recreational cannabis. Posted in 2017 Year in East Bay Politics, Alameda County Board of Supervisors, Anne Kirkpatrick, Ed Lee, Libby Schaaf, Nate Miley, Oakland, Pot Dispensary, san leandro, SEIU Local 1021, strike. Bookmark the permalink.